After booting up the game for the first time, 2.6GB worth of game data is installed on the console along with the trophy list. If you don’t have enough space, be sure to delete some old data before booting up the game. After a short video we encounter a somewhat long loading screen before we jump straight into a race. The first race is a quick tutorial into how to race, including using boost, drifting and weapons. At the end of the race we were awarded with three trophies. The Newcomer trophy is guaranteed at the end of the race, but we also managed to earn Fill ‘er up and Pacifist. STORY: You are Tag, a young graffiti artist turned kart racer who wants to enters the Mod Racing Championship (MRC for short). Luckily, you know someone who knows an ex-kart racer and is now a Crew Chief. Tag starts off as a rookie in the Home Tour. As he wins races, he unlocks more rewards and qualifies for higher-level tours that take him to exotic races all over ModNation. Along the way, you’re pitted against the MRC’s Elite Racers. Each Elite has his or her unique visual style and driving style suited to their respective home tracks. Your aim is to win as many races in the championship as you can and beat all the Elite racers to become the champion. The winner of the championship received a parts package. GAMEPLAY: In order to complete your goal of becoming ModNation Racing Champion, you must win as many races as you can in career mode. Before each race a cut scene appears, usually with two of the MRC commentators: Biff Tradwell and Gary Reasons. 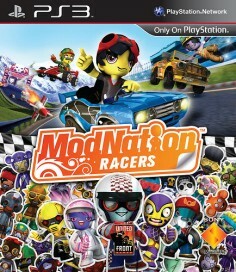 You do also come across some hilarious ModNation Racer adverts (adverts promoting fake in-game businesses or products). You can take on various races from the Race Station. Here you will find the option to race online, have a quick race, split-screen race or continue your career. The online mode lets you race up to 12 players online but this option was unable during time of review as the servers were down. Quick Race has two options: Race and Timetrial, both of which are self explanatory. The Split Screen mode lets you race up to three other players locally on one screen, so if you have a few spare controllers and a few friends over, you can go head-to-head in this mode and have some fun. The career mode is the main single-player mode in ModNation Racers. 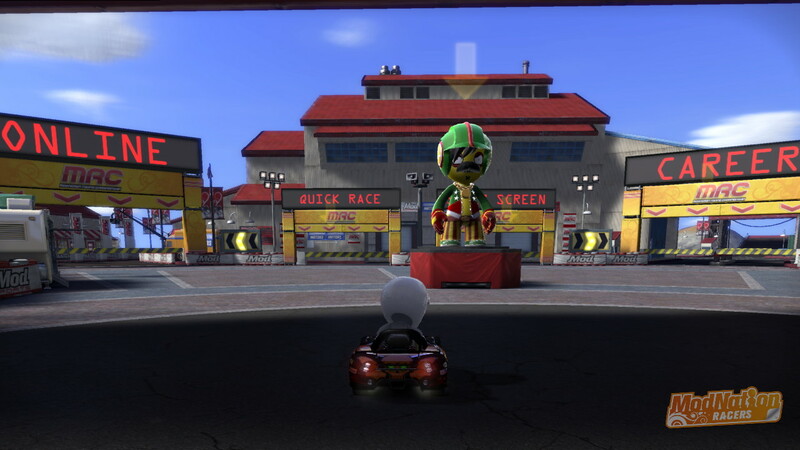 There are five main tours in this mode, made up of multiple races. You are required to win as many races as you can to unlock the next race or tour. In addition, there grudge races and challenges to complete too. 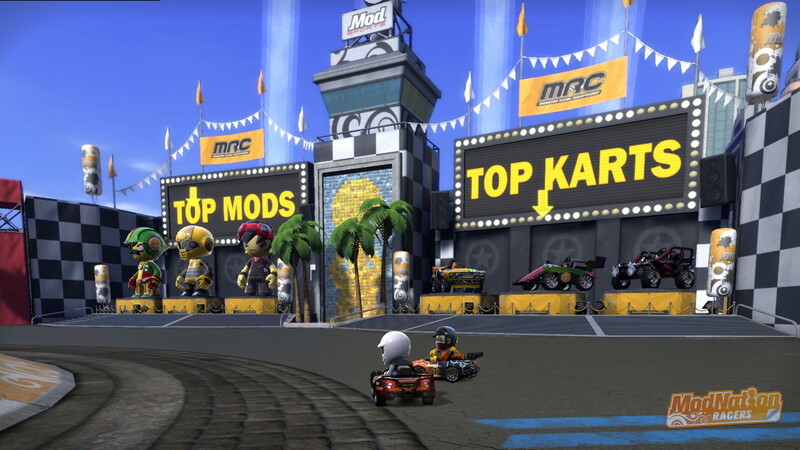 In addition to winning races, you must also complete challenges during races to unlock new content to mod you character and karts with. Each race has at least three challenges, that involve various challenges such as earning a certain number of drift or draft points, racing over boost pads and more. As you progress through the game, the challenges get harder and harder, often requiring each race to be played several times. You can also pick up token in races, which can be used in the shop to unlock new content too. The boost meter plays an important part in races. It is not only used to temporarly increase your speed, it is also used to side-swipe opponents and activate the shield. The boost meter as three sections, meaning with a full boost bar you can activate the shield or side-swipe up to three times. Although you have a shield, the weapons are pretty hard to avoid and requires near-perfect timing when activation the shield. You can build up your boost bar by drifting around corners, earning airtime points by performing aerial tricks, taking down opponents or side-swiping them. You can also earn boost by driving over boost recharge pads and driving well around the track. The weapons are also too powerful at times resulting in losing the race often at the last minute. Of course, it works both ways so you can easily use it to win the race at the last minute too. There are several weapons available in the game ranging from a radial blast to homing missiles. You get weapon access after picking up pods on the track. Picking up more pods while already holding a weapon boosts its power, up to three times. For the homing missile, it means the ability to target multiple opponents. GRAPHICS: ModNations Racers is inspired by urban viral art so you will find a stylish and attractive look and design in the game. The graphics are slick and smooth, with everything in the game colourful and vibrant. The framerate does tend to skip sometimes, even when you are just driving around the ModSpot. The framerate does affect the gameplay quite badly at times – we hate to see what happen when we try racing 11 other players online. The character graphics are pretty basic due to the simplicity of the models, but the customization options are so expansive you can modify everything from clothes, colours and material properties to adding stickers, rotating objects and more. We’ve noticed the graphics to be grainy at times but its not too noticeable while racing. At 720p, the graphics could be better. 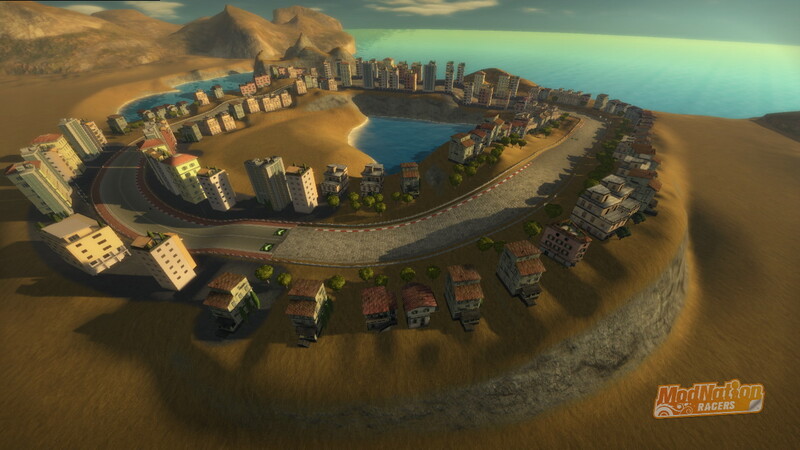 SOUND: While racing, the game makes use of plenty of sound effects from animals in the Farm Yard races to birds singing by the seaside. The game features some background music too but it also supports custom XMB soundtracks so you can play your own music in the background while racing. There is nothing that will get you pumped for a race like the soundtrack to Gone in 60 Seconds or Fast and Furious. The two commentators in career mode provide enough entertainment between races, and often have hilarious things to say. Your characters can also be given voices through the Mod Studio though they don’t really say much during a race. However, during a race the Crew Chief provides some tips and comments on your racing performance, either praising or scolding you. There is enough variation in the voice acting, provided you don’t do the same thing more than a few times in a race. Naturally, by the time you have completed career mode you will probably be annoyed with it all. LONGEVITY: After you are done with the career mode, there is still plenty of fun to be had. 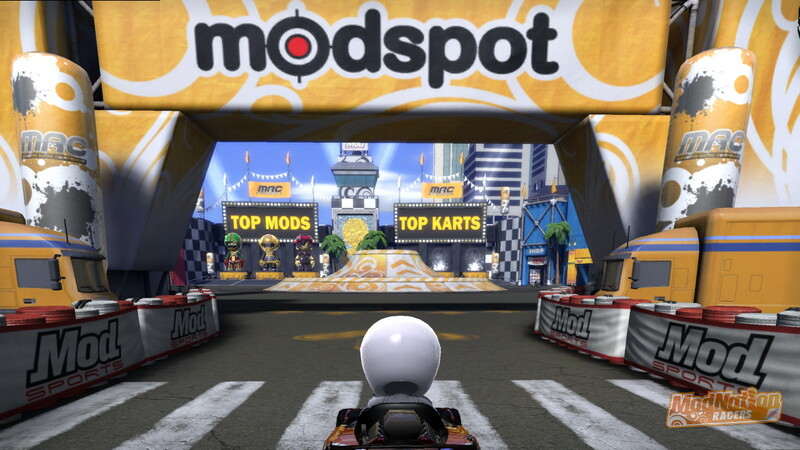 The multiplayer mode in the game lets you race against up to four friends locally using split-screen or go head-to-head with up to 12 players online. You can also spend some time creating new characters, karts and tracks using the items you unlocked through career mode, downloadable content and by collecting tokens. Creating a track is simple using the track creating tool. You can see the track created in real time by driving around the terrain and use the auto-populate functionality to add in all the extras like buildings, trees, boost pads and weapon spawn points. You can create a basic track in five minutes, but modifying the track and making it perfect can take hours – especially if you choose to manually add everything. If creating tracks isn’t for you, you can always download tracks created by others via the PlayStation Network. You can also download new karts and characters too. 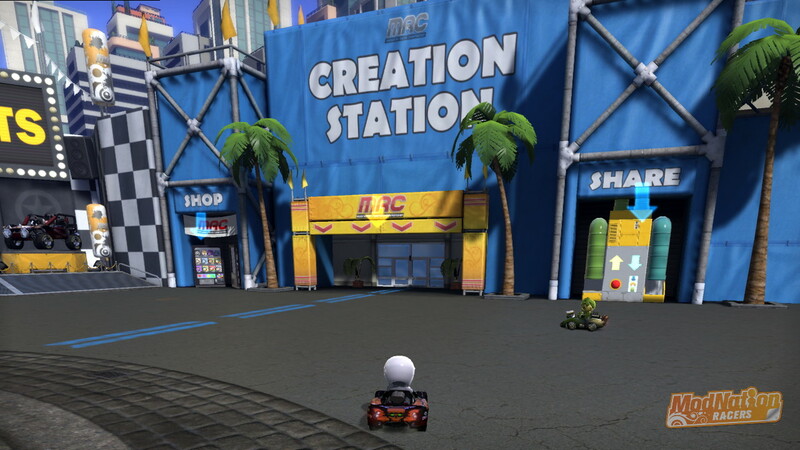 Like LittleBigPlanet, you can expect thousands (if not millions) of tracks, mods and karts to be created so there will be plenty of things to do. While writing this review the ModNation Racer Servers were down (as the game wasn’t available yet) so we were unable to try out the sharing options and online multiplayer races. VERDICT: ModNation Racers is a great game, easily taking up hours of your time. On my first place I spend six straight hours playing the game, trying out everything from career racing to creating my own mods. The game does have a few fatal flaws though. The biggest one is the loading times. Even with game data installed onto the PS3 sometimes you can wait for over a minute for things to load, and there is loading everywhere. From booting up the game for the first time (you will see two loading screens before getting to the ModSpot), to accessing the various Studio editor tools, to starting a race. The framerate is also quite choppy at times, which also gets annoying. Having said that, we feel the game has enough gameplay elements and pretty much unlimited longevity to make this a worthwhile purchase. Lets hope United Front Games fix the loading issues and framerate through a patch (for this reason, we are deducting 0.5 points from the review score). Yes We Are Fixing The Loading Times With A Various Patch We Found.So We Hope It Works And Have Fun Playing.Oh And Just A Little Reminder That Is Important. Pre-Order From Best Buy=Nathan Drake.